On the evening of Saturday, August 4th, Project by Project (Facebook, Twitter) will be hosting its tenth Annual Tasting Benefit, Plate by Plate. For the uninitiated, Project by Project is a national non-profit volunteer organization centered around issues relating to the Asian American community, with the LA chapter celebrating its 15th anniversary this year. As always, the upscale event will showcase the gastronomic talents of some of LA's most popular restaurants, as well as alcoholic and non-alcoholic beverages from a bevy of leading purveyors. 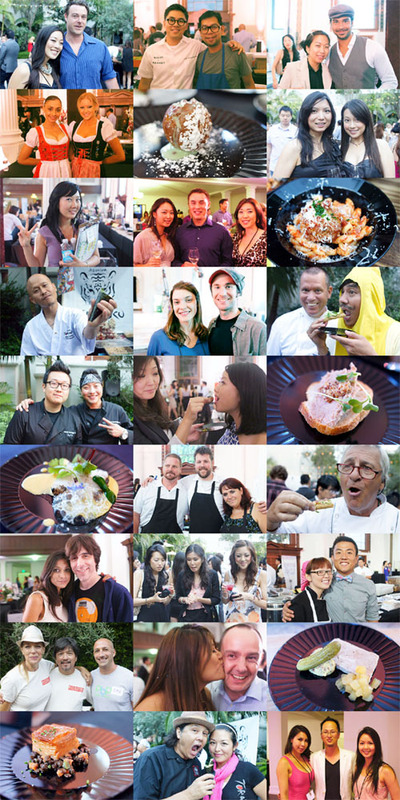 Be sure to check out my report from last year's Plate by Plate tasting. Bistro LQ "Fooding Around in LA"
Tickets are currently on sale at $150 for regular admission. However, I'm giving away two VIP tickets (which let you into the event an hour early), valued at $250 each! To win, just leave a comment with your name, email, and a brief blurb about what you're looking forward to most about the event (the food, the open bar, the women, the men? ), and why. Please submit entries by noon, July 24th. I'll select the best entry and announce the winner Wednesday. Good luck! Plate by plate, I am excited to savor every dish and inhale every morsel of creativity, deliciousness, and energy being executed in the food offered by all of the talented chefs at this event. The opportunity to eat hand crafted food with others who are just as passionate about quality eating as I am would be pure contentment! This would be one of those unforgettable food experiences that one looks back on years after finally moving away from Los Angeles and says, "Damn, did I have a great time eating my way across that ridiculous expanse of city. And wasn't that a hell of a night." In my bid for competitive eating supremacy my goal is to attend Plate by Plate and eat the entire event's offerings in under 3 minutes. This feat of speed eating can only be accomplished with your help, Kevin. My date (which will either be Rihanna or Chris Brown) will gather all the plates while I do my ritualistic exercise of stomach expanding stretches. You won't want to miss this harrowing and monumental achievement. I will allow photos afterward for all who wish to be digitally immortalized with the PbP eating champion. I am ridiculously excited for Providence, Mo-Chicaaa, Playa and of course the Vibiana. Thanks for the chance to win these tickets. I would love to go try and enjoy the great food LA chefs have to offer. Looking forward to: eating, chewing tasting, digesting, walking, looking, oggling, drooling, drinking, slurping, masticating, appreciating, bragging, enjoying, indulging. A long time reader of your site and a young foodie who has used your blog as a resource for picking restaurants for special occasions. So very excited by the opportunity to try such a wide range of dishes from many different restaurants all in one night. A recent decisions to start saving for a house, has resulted in cutting back on dining out. And this would be a great chance to have a fun night out with the boyfriend to sample new food and add to our future restaurant list. The man...definitely the man..especially kevineats!!! HAHHAHA!!!! Who thought of food all day. and if I win I'll scream YAY! Long time reader, 1st time commentor, but love to read your blog while eating at home alone, like sandwhiches. Would love the opportunity to try all the amazing dishes. I am so excited to try out all different great restaurants all in one time! and able to bring my husband to this event (he went to culinary school) after college. We are very passionate about food. Would try everything once! Also this is a non-profile event, Would love to learn and hear more about Project by Project. Another long time reader, first time commentor. I am supremely excited about this event due to the broad range of talent and breadth of culinary flavors and cultures that will be represented. For me, this event will be a true tasting of what much of the world has to offer through a culinary lens. Even more importantly is the purpose of this event. Having spent my career working closely with and supporting non-profits, I believe there is an unfortunate deficiency in human service organizations focusing on the Asian community. This event provides a phenomenal opportunity to support the efforts of a great Asian community non-profit and hopefully provide opportunities for the development of more human services organization. Services such as enrichment of cultural art, music, dances, and what else but FOOD!! Just as important are non-profits providing affordable housing, mental health, career counseling and educational opportunities. The Asian community is a vital and integral part of the Los Angeles heritage that needs to be developed and enriched through the services provided by outstanding human services non-profit organizations. What a great opportunity this event is to achieve just that. I've heard you rave about The Royce so many times, so I'd love to get a sample of what they have to offer as well as Milo & Olive, Rivera and Fundamental LA. Everything else looks awesome too. I want to blog about this event!! I have yet to go to an amazing foodie event like this (because of financial limitations) but I feel like this would take my food blog to the next stratosphere of food blogging amazingness. I get so excited just thinking about it taking photos of all the food, thinking up descriptions of each item tasted, and then compiling a blog post that every reader would envy yet admire! As a returned Peace Corps volunteer and now starving artist who lives with an Asian-American woman and is addicted to food, I am uniquely qualified to represent your following at this worthy event. If the honor is bestowed upon me, I will consider it my duty to taste every edible or potable morsel offered by these fine purveyors at the risk of life, limb and arteries. Just out of college, trying to get into the LA food scene. Lived in Santa Barbara where the food scene isn't as ethnic and cultured, nor nearly exciting but now I'm back and ready to explore (given my budget and debt). This would be a great opportunity to get involved and meet new people and most importantly, try new (and old) foods the LA area has to offer. Recently moved to LA, subscribed to your blog, and trying to hit all the restaurants you are writing about. We're not very far along and going to Plate by Plate would be an amazing way to kickstart our progress! I'm 60 and just 2 years into getting my feet wet in the foodie scene. Your blog has directed my new food journey on some amazing discoveries. Going to the Plate to Plate event would totally blow me away. Thanks for writing to deliciously and photographing so real! good food should be experienced even by commoners like me. I'm very exited to taste food from some of L.A's best restaurants and for a good cause and to also get to meet the chefs at the event! I am looking forward to the food the most. I am a green (as in new, not as in ecological) food blogger (offaloffal.com, theoffalo.com), and to be able to sample food from an amazing variety of chefs would be an incredible opportunity for me. Also, as an Asian-American who grew up in mostly white communities, I never really identified with the Asian American community. Since I've moved to L.A. nine years ago, and as I am raising my multi-racial kids in this very multi-cultural environment, I have become more aware of the importance of racial and cultural identity and am trying to figure out the best way to navigate the topic with my kids. Reading about Project by Project on their website (http://www.projectbyproject.org/), it sounds like an interesting and worthwhile organization, and I look forward to learning more about them. I would love to take my soon to be fiancé to the foodie event of the year. She never really try many of good restaurants in la.. This is a perfect chance for me to show her all the good eats and propose to her there on that night! I'm looking forward to finding a 400 pound, 7 foot tall man standing next to a door. Every so often, someone comes by, stands on their tiptoes, and whispers a password in his ear. He creaks open the door, and they silently slip through. As I'm an excellent lip reader, it wouldn't take long for me to figure out the password, and wala! - I'm in the double secret foie tasting room! I am looking forward to tasting the inspirational and unique creations from each chef and mixologist and getting my taste buds all excited! Also, to celebrate this communal dining fete with people that continue to uplift and support the Asian American community. I have never attended this function and would love the chance to enjoy such a festive event. Taste all the different beers from The Bruery! Oh and of course all the different foods! I'd like to see what Connie and Ted's has to offer! I would enjoy eating at any of these restaurants (especially paired with the beverages offered here). But what excites me is the extremely unique opportunity for side by side comparison. One can hope this will shed insight on what is truly hot right now and what future trends will look like within LA's culinary milieu. I'm looking forward to try all the yummy food. I couldn't go last year, so I'm really hoping to go this year! Please make my wish come true! Very much looking forward to the amazing lineup of noms and have new material to write about on our food blog (www.nomnomcat.com). I'd love to try all the food!! makes me scream "questo non basta!" Being one of the nine Caucasian foodies at this event. Maybe talk with you about getting down to San Diego a little more often. This looks like a fantastic event for a great cause in which I would love to participate. Since I am about to start graduate school, I have to drastically cut down on this sort of indulgence for a couple of years, and would very much appreciate the chance to attend due to the numerous restaurants (especially Providence, The Royce, Rustic Canyon, and Bistro LQ) I have not yet had the chance to sample, and likely will not for a while. Even more significantly, my girlfriend is a high school teacher, and the event falls at the end of her first week back for the new school year. She will certainly be in need of a few sanity-restoring drinks. just letting everyone know, this event is AWESOME! I was one of the winners last year. And unfortunately I am going out of town that week and won't be able to go. Good lucky everyone! I don't think there's going to be many opportunities to sample and experience food from so many talented chefs under one roof such as this one. Not only will it be an honor to be surrounded by these master artisans, but to acknowledge the great work of Project by Project, who have helped so many and have brought issues related to the AA community to the forefront. Hi Kevin, I love your blog and I have been living vicariously through your awesome reviews and tasty photos! I admire what Project by Project is doing for the asian community and it's great to see you support Plate by Plate. I'm currently a broke law student and don't really have the funds to try the amazing restaurants LA has to offer. I would really love the opportunity to meet the chefs and try all these amazing restaurants and beverages. I missed my chance to try foie gras since it has been banned in CA and I heard they are having two forms of foie gras at the event. What I look forward to is the opportunity to trying my very first foie gras from Bistro LQ and sharing my passion as a foodie with others! Thanks! Definitely looking forward to trying every single bite and drinking way more than I should. It's one of my dreams to go to an event like this where I can eat and drink to my heart's content...that and with my sister as my plus 1, I'm in search of a hot guy for her. Congrats to Jordan Sandler! Have a great time! Actually, last year I actually gave away the tickets separately, but I decided to do the pair this year for the reason you stated. You actually had a great entry, but I had to ding you for not leaving your name (as per the instructions).